One comment sends a birthday party into shambles on The Real Housewives of Orange County. "A Peace Treaty, A Blind Date, and a Divorce No One Undertands" is the ninth episode of the show's 13th season. 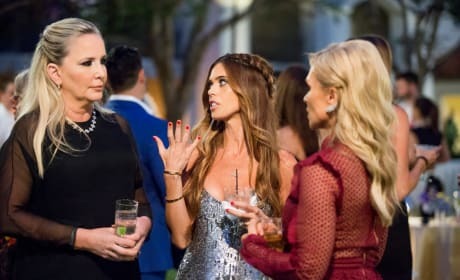 Shannon and Emily have a confrontation on The Real Housewives of Orange County. "She Said/She Said" is the seventh episode of the show's 13th season. The news comes out about what occurred at the poker game on The Real Housewives of Orange County. "Rumors" is the sixth episode of the show's 13th season. Things get dramatic when the ladies play poker on The Real Housewives of Orange County. "Orange County Hold 'Em" is the fifth episode of the show's 13th season. Vicki gets raked over the coals for her secrets on The Real Housewives of Orange County. "Judge, Jury and Gina" is the fourth episode of the show's 13th season. 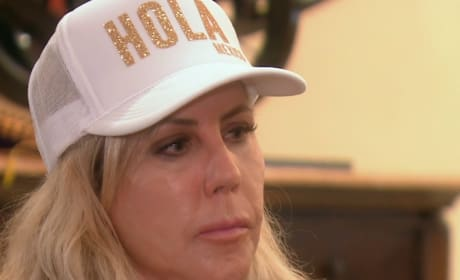 Kelly's argument with Vicki comes to a tearful end on The Real Housewives of Orange County. "Tres Amigas" is the third episode of the show's 13th season. Tamra introduces her new friend, Gina on The Real Housewives of Orange County. "One Apology, Another Betrayal" is the second episode of the show's 13th season. The ladies work to rebuild their friendship on the season premiere of The Real Housewives of Orange County. "The Next Chap" is the first episode of the show's 13th season. Meghan rehashes her text message feud with Kelly on The Real Housewives of Orange County. Lydia is in the hot seat on part one of The Real Housewives of Orange County reunion. Shannon, Lydia, and Tamara do not look happy during this conversation on The Real Housewives of Orange County.